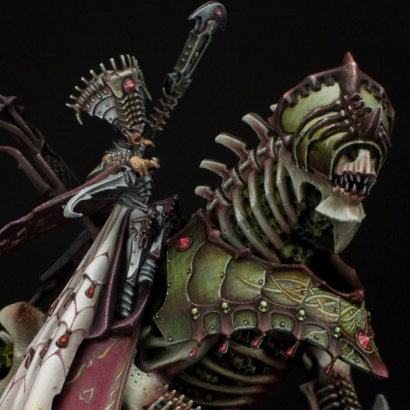 Besides just being a fantastic paint job, this is a rather unique looking Neferata. While the actual model itself hasn't been converted too much, the inclusion of the scenic base really adds a ton of atmosphere to the model. 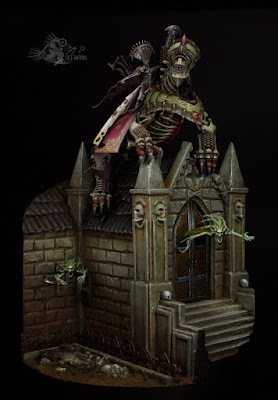 I really like the spirit hosts coming through the walls of the crypt. The crypt itself is very nice too, and a little more subdued then we are used to seeing in Warhammer scenery. Having the armor painted a sickly looking green on her mount is not something I have seen before. It seems odd at first for a vampire, but it contrasts really well with Neferata and the more ruddy tone of the Dread Abyssal's "skin". That's another thing I really like. Usually it would be painted like bone, and while it has a definite bone feel to it, it also has a lot of warmer, fleshy tones to it. You can see this most around the mouth. It makes it truly creepy looking and even more unnatural. Is it made of bone or some kind of weird fleshy bone? All of the painting is smooth and crisp with just the right amount of weathering. All of the colors have also been kept rather subdued giving it a more realistic feeling, despite how otherworldly it is. Giving Neferata white armor is another unique color choice and one that really pays off. She is royalty after all. The free hand on the Abyssal's armor and Neferata's cloth is the final finishing touch and executed perfectly. Overall this is a really well done Neferata that will definitely stand out from the crowd, both in terms of quality and atmosphere. Be sure to check out more views of the model on Putty and Paint, and show the artist some love if you like it.